Poor tree! For that matter, poor pavement! The photo above underscores what street trees often have to suffer through. With the trunk surrounded by concrete on all sides, the results are lifted pavements for pedestrians, and too little water for the tree. Amazingly, some people call for the offending trees to be cut down, but there’s a better solution. Why not give the trees more space? Plenty of space, with less concrete and happier trees. Marrickville Council is one council pursuing this policy. When a pavement comes up for renewal as part of the regular maintenance (planned five years ahead), a bigger opening is left for trees. This gives the trees more space, and allows more rain to absorb into the ground, rather than into the stormwater system. I imagine it also saves a small (but measurable) amount of concrete. Residents can’t wait to plant underneath their trees. Biodiversity is also increased when low plants, such as lomandras and dianellas, are planted around the base of the trees. With an even larger space, it becomes possible to establish a true verge garden. Marrickville Council also goes beyond this. At the time of writing, the Sustainable Streets program enables residents to cut spaces out of their concrete verge for a small fee. If the majority of a street requests street gardens then the council will cut out the concrete, provide some extra soil, and even throw in some plants for free. The pavement running alongside Petersham Park: half concrete, half gravel. As a final note, this pavement work next to Petersham Park is another small but elegant example of the principle at work. Instead of re-laying the whole pavement with concrete, gravel was laid down for half the width. When I talked to the Council about this, they highlighted the benefits of less run-off, as well as providing more rain for the avenue of trees. Councils have a big role to play in the sustainability of our local environment. If we can keep changing default policies to encompass environmental thinking, we’re well on our way to saving the planet! This entry was posted in Local issues, Saving the environment and tagged marrickville, marrickville council, pavement, runoff, street, street trees, sustainable streets, trees, verge gardens, water. One of the topics that came up at my first Marrickville Council Environment Committee meeting was the Council’s recent (?) policy of widening the cut-out around street trees, as shown in the photo above (taken a block away from our house on Old Canterbury Rd). Hardy natives, such as Lomandras and Dianellas are then planted around the base of the tree. Of course, it’s not a new idea. In the streets around us, hundreds of trees have had plants guerrilla gardened in underneath them. The variety is the great bit, from natives to exotics, grasses and flowers. Perhaps the Council is just catching up with the local residents! Gardening around the base of street trees — have residents been leading the way? This entry was posted in Guerrilla gardening, Saving the environment and tagged council, guerilla gardening, marrickville council, street, street trees, trees. Early this year, I volunteered to join Marrickville Council’s Environment Committee, which meets quarterly. I was one of a large number of new members, and there’s a wide range of very interesting people on the Committee. One is a local cafe owner, several are street gardners, and we have at least one environmental researcher. We’ve had our first meeting with the new members, and it was interesting (if not exciting — it is a Committee after all!). The main topic that was discussed was the results of a recent tree audit commissioned by the Council. Many figures were shared about the type, size, nature and health of trees across the local government area. One of my takeaways from the meeting was the idea of the “urban forest”. It’s a simple yet powerful phase, encompassing the idea that the trees as a whole make up a “forest” across the area. This leads naturally to discussions about increasing canopy coverage and biodiversity. This entry was posted in Saving the environment and tagged council, marrickville, marrickville council. Community gardens are unique forms of public open space which are managed by the community primarily for the production of food and to contribute to the development of a sustainable urban environment. They are places for learning and sharing about sustainable living practices, and for actively building community through shared activities. The City of Sydney recognises community gardening as a valuable recreational activity that contributes to the health and well-being of the wider community and provides a wide range of environmental, social and educational benefits. There are currently thirteen community gardens across the Local Government Area (LGA) and this is expected to increase significantly in the near future due to high community demand and to support the vision of Sustainable Sydney 2030. The purpose of the Community Gardens Policy is to establish a framework for the City’s commitment to the appropriate management of both new and existing community gardens. This framework will provide a clear procedure for the establishment of new gardens, outline a basis for communication and partnership between stakeholders and provide a rationale for decision making that ensures consistency in the management of all community gardens in the City of Sydney. PS. I’ve been away in Europe for three weeks (for work), but thankfully Miss P has been ably looking after the garden. Now that the jetlag is receding, there will hopefully be an upswing of postings. This entry was posted in Growing our own food, Local issues and tagged community garden, council, gardens, marrickville council, policy. When we put in our water tank early last year, we received a rebate from Marrickville Council, which was much appreciated. This also started a dialogue with the water folks at the Council. 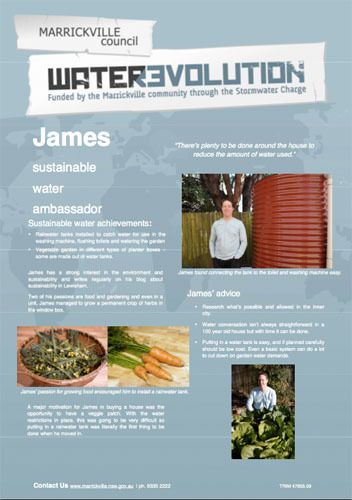 As a result of this, I agreed to become a “Sustainable Water Ambassador”, and the details on this have just gone live. There are details on the overall programme, as well as the poster (PDF) showcasing what we’ve done. So far this hasn’t involved doing much, although we were one of the stops on a local tour of water sustainable houses. I’ve also been invited to be a member of a Council working party on sustainability, which should be interesting. This entry was posted in Saving the environment and tagged ambassador, marrickville, marrickville council, water, water tanks.